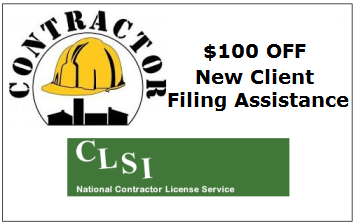 CLSI knows the State Board Contractor License Laws of all the State and all are unique Contractor's License Laws. Some states allow reciprocity with other states, while others require you to complete the entire contractor's license process like everyone else. Also some States do not require a formal contractor's license to perform work. Read the following steps to learn how to get your contractor's license. Or contact us or fill out the Free Quote Request Form. The first step on the road to getting your contractor's license is determine what type of contractor's license you will need in order to perform the work you would like to do. Many States vary on their license classification names and/or codes. You will need to contact the Contractors State Licensing Board to obtain this information. Or contact our staff to help match your skills and experience with the appropriate license classification in any state that requires a license. The majority of states that require a contractor's license will require that a qualified individual take and pass a trade and a business and law exam. When you discover the type of license the "State" will require you to obtain, you can then schedule an exam date. Exam date information can be obtained by contacting the Contractors State Licensing Board for your state, or give us a call and we can assist you in signing up for the next available exam date. If you are interested in taking a course to prepare you for the state exam, we can schedule it for you. Seminars are GUARANTEED to make the exam process less stressful for you. Contact us to schedule a seminar for you. If the state you are applying for a license in requires an exam, you MUST pass the state exam before you can apply for your contractor's license. If you are in a hurry, same day scoring is available for most exams in most states. Some states will allow you to use the "Same Day" scores to apply for a license. We recommend that you follow these Contractors State License Exam Preparation tips. At this point, you will now need to decide on what type of business entity your company will be set up as. Your choices are: Sole Proprietorship, Partnership, Corporation, or LLC. Information regarding setting up your business entity can be found in the "Licensing Information Packet" that you can request from the each Contractors State Licensing Board. Our company has assisted thousands of individuals in setting up their business entities. We have experience with Foreign/Domestic corporations, LLC's, partnerships, as well as sole proprietorships. Most states require that you at least carry Workers Compensation Insurance if you have any employees. Some companies may qualify for an exemption from Workers Compensation Insurance. Another commonly acquired insurance is General Liability Insurance. This insurance covers the work that you and your employees perform. Most states do not require that you carry this type of insurance, but we highly recommend it. Feel free to contact us with any questions. Each state has its own licensing requirements. Because of this, it is almost impossible for us to list a detailed cost breakdown for every state. For a Complete Cost Estimate for any state, please fill out the cost estimate request form. (505) 452-8311 any time if you have any questions.